This collection of nine short stories includes backstories, sequels and what-ifs to Jane Austen's beloved novels. Greensmith provides sympathetic insights into characters you love to hate. Her what-if stories are realistic, true to Austen’s characters, and delightful to sink your teeth into. And always, Greensmith, Romantic that she is, calls forth the power and beauty of the natural world to heal, bless, and nurture the wounded, the misunderstood, the lonely, and the confused on their journeys through life. In Jane Greensmith's Intimations of Austen, I've found something that I generally feel lacking from Austen spin-offs and sequels. It's hard to put my finger on, but it's a pleasurable something. I think it's in the fact that, where many writers strive to "sound like" or feel like Jane -- and fail -- or imitate her characters in a sort of cardboard way, Greensmith chooses instead to give us embellishments on the characters and stories that we love, but in her own style and her own voice. 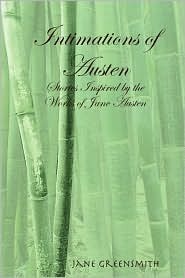 Her stories don't just recycle what Austen wrote, they play off of them and expand them, taking them in new and interesting directions. They are short and sweet little snippets of maybes and what-ifs. Greensmith often adapts a darker, more somber tone than some may like to see on their beloved Austen, but I think she also shows great insight into the stories, characters, and more importantly, the time and realities of the era. It also seems like her stories are the result of real ponderings, philosophical think-sessions brought on during rereads of Austen; they read like they've been mulled over and considered, not as if they are writing prompts (Imagine Darcy has synesthesia: go!) or challenges to distort Austen and see what comes out. They touch on or answer some of the things I've wondered myself when I reread Austen, or the odd little train-of-thought pieces that crop up and lead you somewhere that you were expecting to go, but maybe always knew you would. You find yourself confronting what-ifs, like what would happen if Darcy had been forced to promise not to propose to Elizabeth, or confronting real possibilities, like how does Fanny trust Edmund's love is real, and does she learn to speak up? Things that I've always asked myself when reading Austen are present in this book in really interesting ways, sometimes sublte with a kicker, and sometimes head-on. So if you're in the mood for embellishments on the stories you love, I'd say pick this up. At 9 short stories and just over 100 pages, you certainly won't regret the time spent, and I think it will have you thinking long after you close the book. Make sure to check out my interview with author Jane Greensmith, as well as her generous giveaway of 2 signed copies of her book, Intimations of Austen!